In Brazil, where forest meets savanna, new towns, agribusiness and hydroelectricity plants form a patchwork with the indigenous territories. Here, agricultural work, fishing, songs, feasts and exchanges occupy the Enawenê-nawê for eight months of each year, during a season called Yankwa. 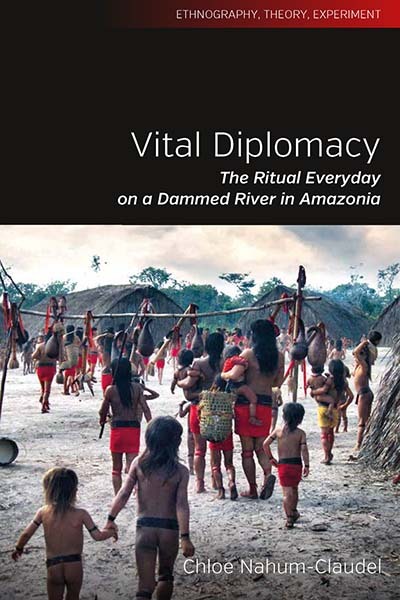 Vital Diplomacy focuses on this major ceremonial cycle to shed new light on classic Amazonian themes such as kinship, gender, manioc cultivation and cuisine, relations with non-humans and foreigners, and the interplay of myth and practice, exploring how ritual contains and diverts the threat of violence by reconciling antagonistic spirits, coordinating social and gender divides, and channelling foreign relations and resources. Chloe Nahum-Claudel is a Leverhulme Trust Early Career Fellow in the LSE Department of Social Anthropology. She has previously held research fellowships at Pembroke College, University of Cambridge, and at the École des Hautes Études en Sciences Sociales.